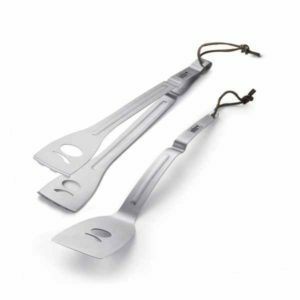 Explore our broad range of outdoor grilling accessories for Weber and Broil King barbecues. 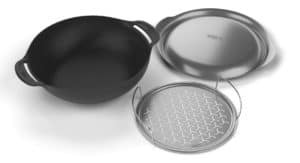 All the tools you need to complement and enhance your grilling experience, from accessory kits to pizza stones. 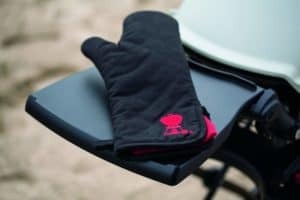 These also make perfect gifts for the griller in your life. 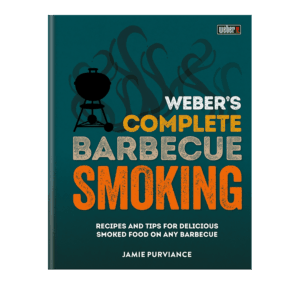 Learn how to cook low and slow like a pro with this superb recipe book from renowned barbecue expert and an award-winning and New York Times bestselling cookbook author Jamie Purviance. Stacked full of recipes on how to cook classic dishes like baby back ribs to ambitious new flavors like smoked duck. This book is a great guide for beginners, a refresher for experts or a superb gift for the griller in your family. 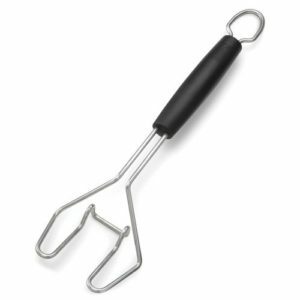 The Broil King professional stainless steel Basting Brush is an essential accessory for every barbecue. Convenient & safe to use. Did you know that grilling with wood chips add more layers of flavour and aroma to dishes? 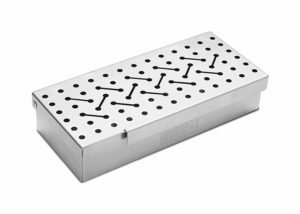 The Broil King Smoker Box offers the ability to achieve superior tastes. 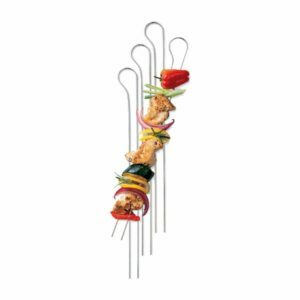 Broil King Narrow Kebab Rack is a perfect space-saving solution for all kebab lovers. 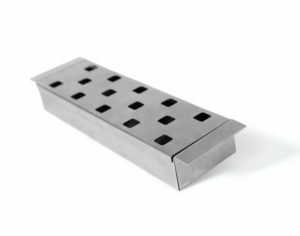 It covers slightly more than one standard grid segment, holds 4 dual prong skewers at a time and can be placed in two different positions. 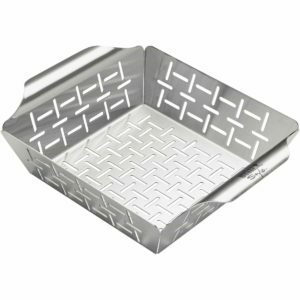 Enhance your grilling experience by using Broil King Deluxe Grill Basket. Rost food conveniently & with ease. A perfect solution for grilling smaller and delicate food. 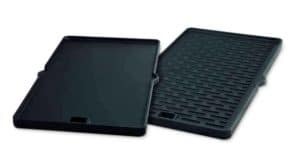 Expand your Barbecue capabilities with this reversible griddle. 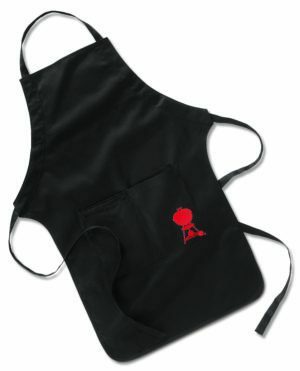 Perfect for frying breakfast or searing steak. 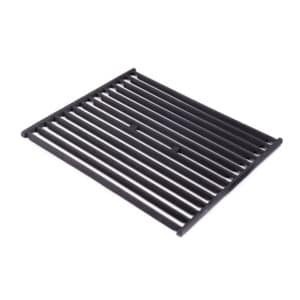 Broil King Cast Iron Cooking Grids provide a stable cooking area for grilling. 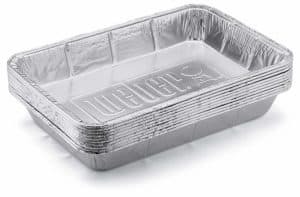 Suitable for Crown and Signet gas barbecues. Put the foil away and roast your ribs to perfection with this innovative accessory that helps keeps your ribs from getting greasy. 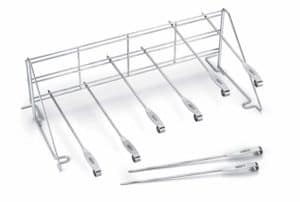 The internal roasting rack elevates ribs off the bottom of the pot to steam in their juices or other flavored liquids for perfect steam and smoke cooked ribs every time. 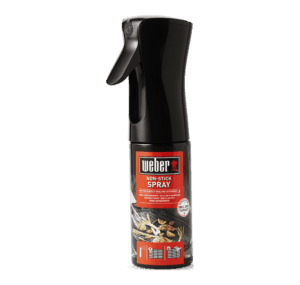 Weber non-stick BBQ spray will help prevent food from sticking to the grates, trays or griddles. This spray is non-flammable, odourless and tasteless so will not taint the taste of your barbecue food. Take care of your grill with this enamel cleaning spray. 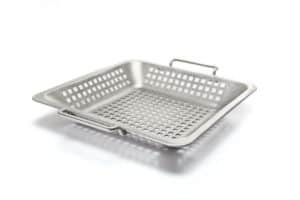 Perfect for taking care of enameled parts like grills and flavourizer bars. Simply spray on grease and wipe off while your barbecue is not in use to leave your grill looking like new. 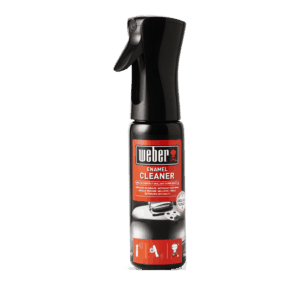 This 2 in 1 mist spray is a perfect solution for cleaning grates and flavouriser bars across the entire Weber range. This spray degreases and cleans your barbecue without fuss. Just spray, leave it to sit for 60 seconds and clean. 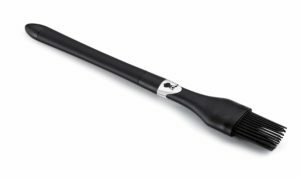 This grill brush is the perfect solution to get those hard to reach areas on your grill. 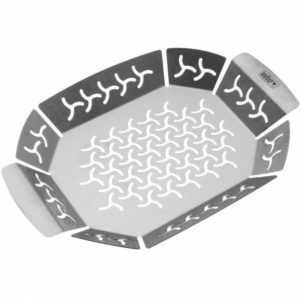 The ergonomic handle helps your grip as the unique three side design helps you get down into hard to reach places. Packed with stainless steel bristles to help remove the toughest stains. This brush is a perfect tool for keeping your grill as good as new. 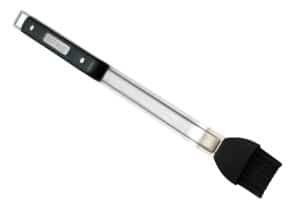 Measure the temprature of your grill or smoker with this ambient temperature probe and have it sent to your smartphone. 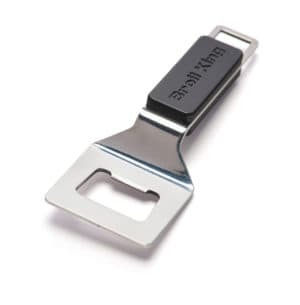 Clip the included probe onto the cooking grate and attach to the iGrill. Then open the app to monitor your grill. 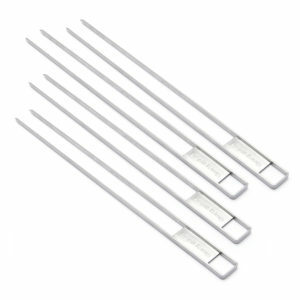 This probe also has increased water resistance to protect against steam damage. 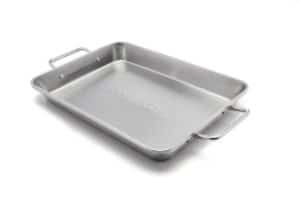 Made with the same stainless steel construction as the original included in your Weber barbecue. 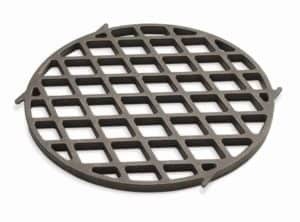 This is a replacement part for the charcoal grate. 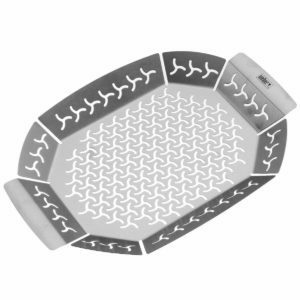 Please note this is not a cooking grate. Create delicious kabobs or handle delicate food easily with this skewer set. 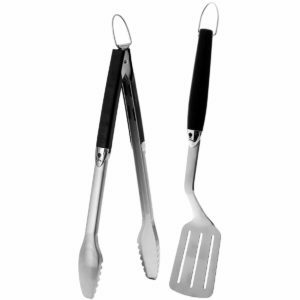 With the double pronged set up, never worry about food falling off as you cook on all sides. 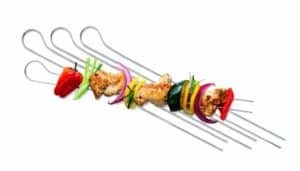 These skewers are stainless steel and are also dishwasher safe for easy cleaning. 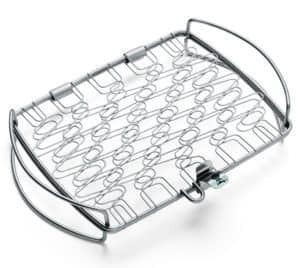 Elevate your cooking with this unique rack designed for even heating. Perfect for slow cooking and making kebabs. Grill your meat and vegtables to perfection. 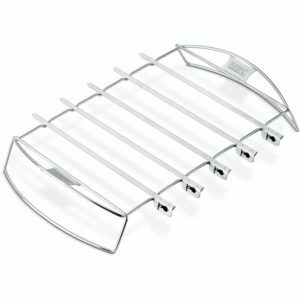 This stainless steel rack is also easy to clean, dishwasher safe and collapses back for easy storage. 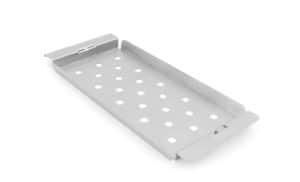 A fast and safe solution to lifting the grate on your Weber barbecue. 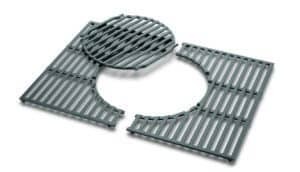 Slip the lifter under the grate to get access underneath quickly and safely. 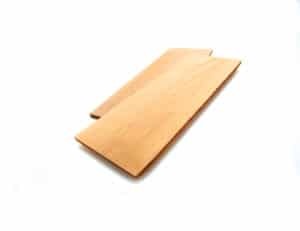 This lifter has a non-slip coated handle for additional safety. Make perfect "Beer Can Chicken" with this brilliant poultry roaster. 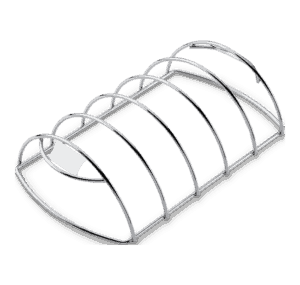 Designed to fit on your Grill. 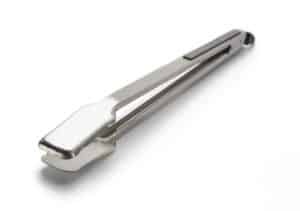 This tool will help infuse moisture and flavor into your roasts. 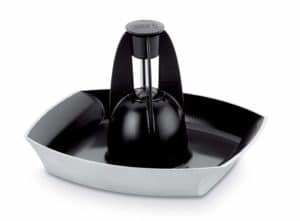 Made of non-stick and easy to clean ceramic parts. 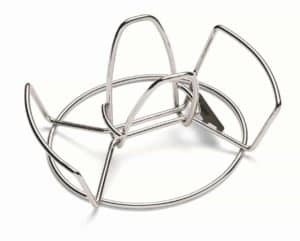 This is a perfect accessory to create brilliant poultry roasts every time. A fantastic product for gatherings and parties. 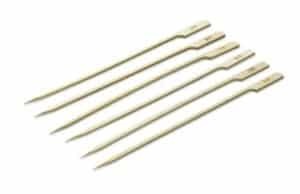 These strong bamboo skewers can be used on the grill, are perfect for holding food and disposable. Perfect for Kabobs or sausages. 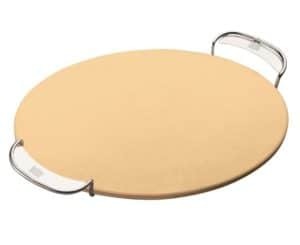 Make fantastic ribs every time with this unique accessory. Compatible with Weber grills. 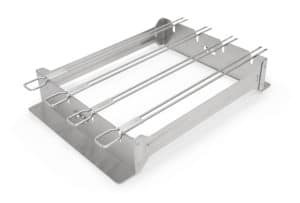 This rack elevates ribs off the grill grates for perfect smoked ribs without any grease. Made from stainless steel. This rack is also dishwasher safe for easy cleaning. Ergonomically designed and elegantly constructed. 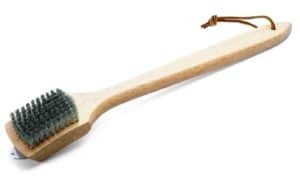 This basting brush is the perfect accompaniment for spreading sauce and glaze across your food. The silicone bristles are designed to resist odors. and the non-slip grip helps you keep a firm hold. Finally, the brush is dishwasher safe to ensure it lasts a long time. Never worry about sloppy cuts on your pizza again. 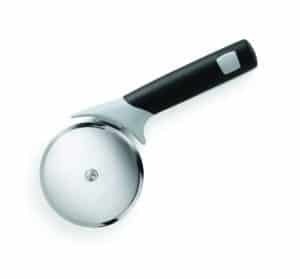 This pizza cutter's 4 inch circular blade is designed to go through all sorts of crusts with minimal fuss. 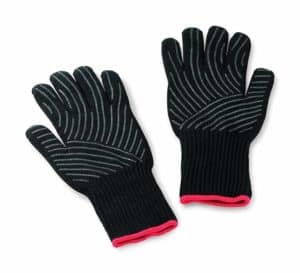 Featuring a soft non-slip grip handle. 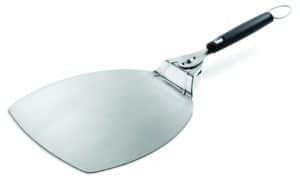 This Pizza cutter is stainless steel and designed with an edge guard to make sure it doesn't stain your counter when setting it down. A perfect accompaniment to the Pizza stone. 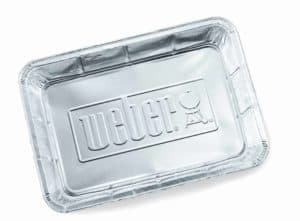 Add some more flavor to your cooking with Weber's patented Flavorizer bars. Constructed with Porcelain enamel to prevent corrosion. 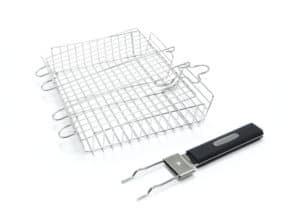 These bars catch drippings and create a smokey flavour to your food while also protecting your grill burners. 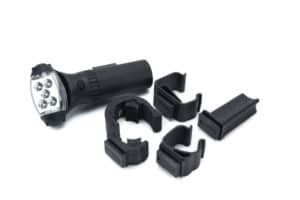 These bars can be precisely fitted into your Weber Genesis with no tools required. 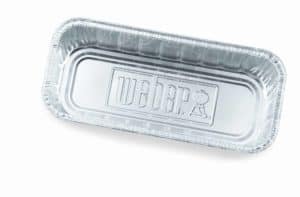 Add some more flavor to your cooking with Weber's patented Flavorizer bars. Constructed with Porcelain enamel to prevent corrosion. 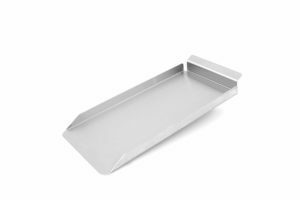 These bars catch drippings and create a smokey flavour to your food while also protecting your grill burners. These bars can be precisely fitted into your Weber Spirit with no tools required. 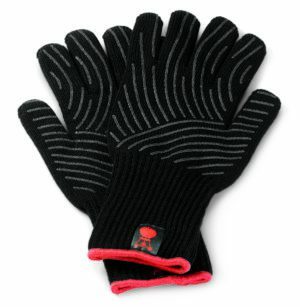 Protect your hands from high temperatures when grilling with this set of insulated gloves. 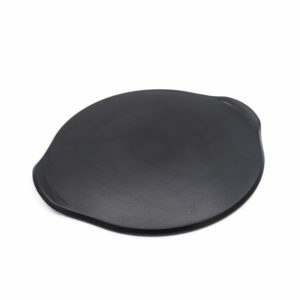 The silicone pattern on the outside helps with your grip even in the heat. A perfect set for those who get hands on with their grilling. 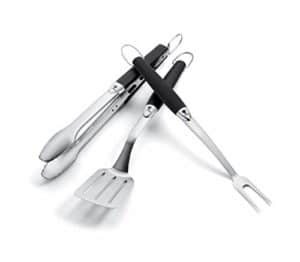 Unlock your full grilling potential with this three piece set of high quality grilling utensils. Featuring locking tongs, a spatula and a fork. 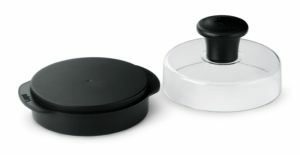 These utensils come with a non-slip grip handle and are dishwasher safe. 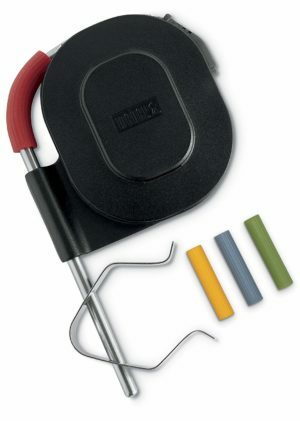 These tools also come with hooks that perfectly fit on tool hooks fitted on Weber grills.The perfect tool set for serious grillers. 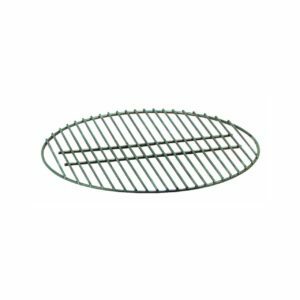 <strong>Weber Original GBS Sear Grate 8834</strong> Designed for the Weber gourmet grill system you can sear hot and fast to seal in juices for steaks,chops and cutlets. 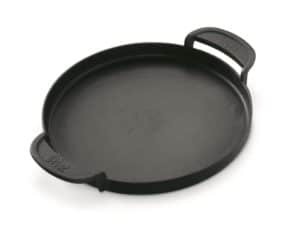 The cast iron sear grate is non stick and distributes the heat evenly across its surface. 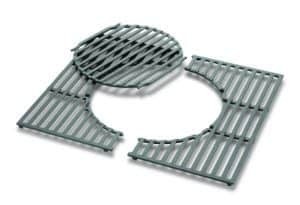 Greasy grates will eventually suffer from uneven heat distribution and flare-ups. 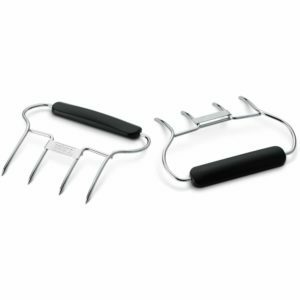 Look after your barbecue with Weber® Grill Brushes. These are heavy duty, steel bristled grate brushes with bamboo handles. 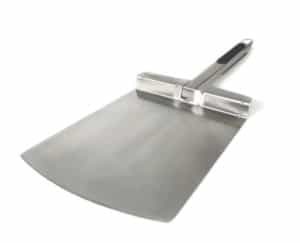 They come with a notched scraper to help get rid of baked on juices and grease. Choose from 30cm or 45cm grill brush. 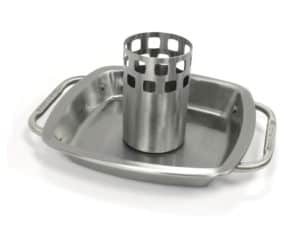 Weber Original GBS WOK and Steamer A superb addition to your Weber GBS barbecue. 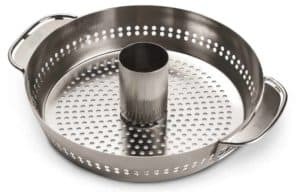 This wok and steamer is perfect for or deliciously healthy Asian style cooking on the Barbeque. 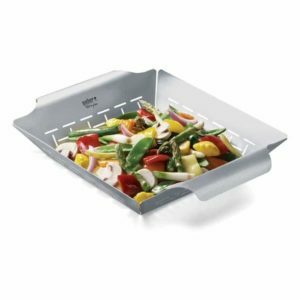 The cast iron wok is non stick and distributes the heat evenly to caramelise meat and vegetables while the included steamer tray allows you to cook tender steamed fish and vegetables. Easily hand washed for long term use. This is an exceptional addition to your Weber GBS barbecue. 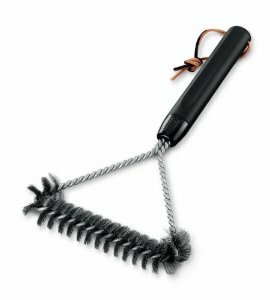 Shaped like a triangle, this 12 inch / 30 cm three-sided brush cleans in between the cooking grates and in tight spaces at the edges of the grilling surface. This tough brush makes cleaning your grill a breeze. 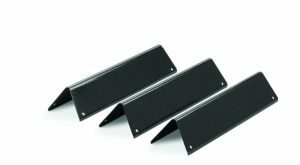 Shaped like a triangle, this three-sided brush cleans in between the cooking grates and in tight spaces at the edges of the grilling surface. 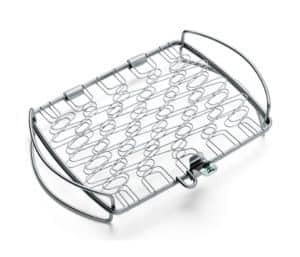 Weber Original GBS Griddle 7421 Designed for the Weber Gourmet grill system, the GBS Griddle is perfect for pancakes, fry ups and griddling vegetables. 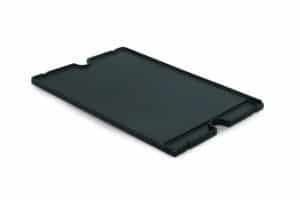 The cast iron griddle is non stick and distributes heat evenly across the surface. 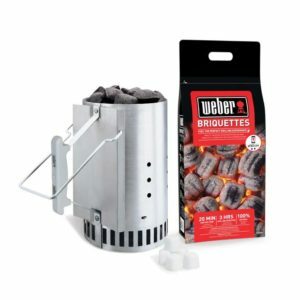 Weber BBQ Chimney Starter Kit - Fill the chimney starter with the correct amount of charcoal for your barbecue, light the firelighters and place the chimney over the top. Leave the chimney to light all the charcoal then simply pour into your barbecue and get grilling. 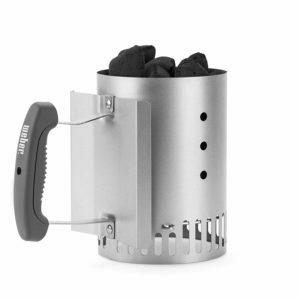 Get your portable Charcoal BBQ cooking quickly with this compact Rapid Fire Chimney Starter. Light coals in 15 minutes without the need of lighter fluid. 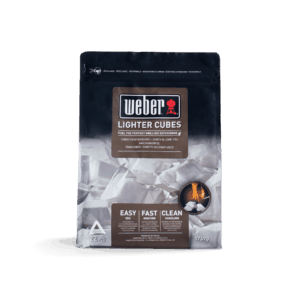 Just place coals on top of Weber lighter cubes or newspaper and light. Perfect for camping and short trips. 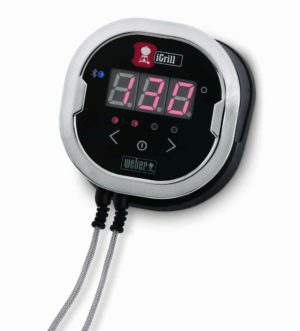 Weber IGRILL 2 7221 Connect this versatile thermometer to the free Weber iGrill app via Bluetooth and measure both core and ambient temperature. you can use the pre-settings or make your own how you like it. 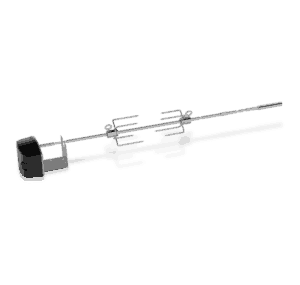 comes with two probes but can facilitate 4 probes. 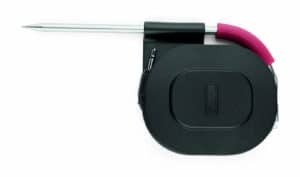 Weber IGRILL Pro Meat Probe 7211 This pro meat probe is is specifically designed for precision temperature tracking with the IGRILl 2 and the Igrill mini. 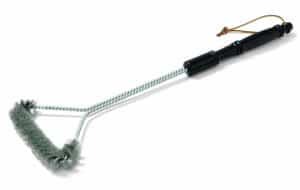 this heavy duty meat probe measures between -30 degrees and +327 Degrees with a length of 1.2m. this is designed for extreme grilling and smoking. 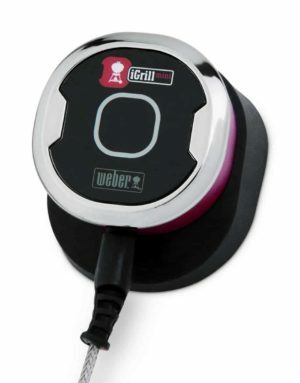 Weber IGRILL MINI 7220) If you are into gadgets this little gismo is a must. 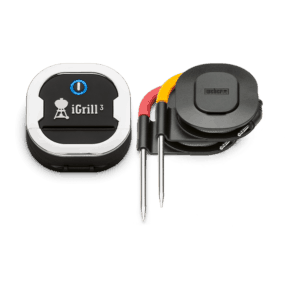 The Igrill mini pocket sized thermometer connects to the free weber igrill app with a range of 45m. 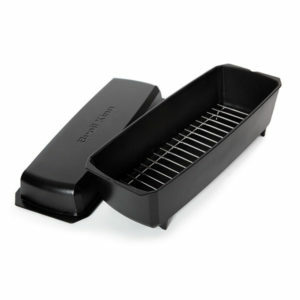 Odourless, non-toxic and easy to use barbecue lighter cubes. 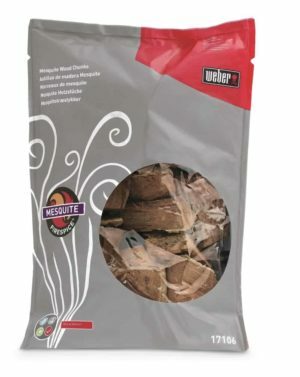 Weber Wood Chips - Beech If you want to really impress your guests you can enhance the flavour of your food with a range of Firespice woodchips. Just soak the chips in water, drop them into the smoker box and place on the grill plates in the corner of your BBQ. 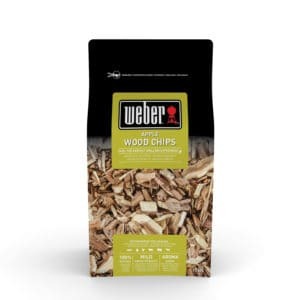 Weber Wood Chips - Whiskey Oak If you want to really impress your guests you can enhance the flavor of your food with a range of Firespice woodchips. Just soak the chips in water, drop them into the smoker box and place on the grill plates in the corner of your BBQ. Each resealable packet contains 700g of flavored wood chips. 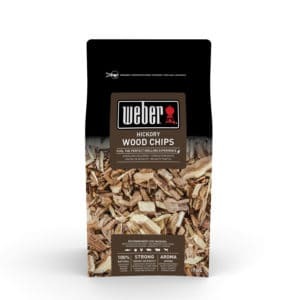 Weber Wood Chips - Apple 17621 If you want to really impress your guests you can enhance the flavour of your food with a choice of five Firespice woodchips, Pecan, Apple, cherry Hickory and Mesquite. just soak the chips in water, drop them into the smoker box and place on the grill plates in the corner of your BBQ. 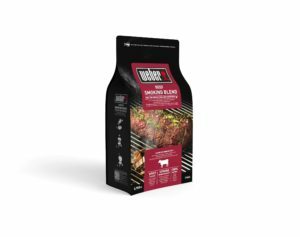 Weber Wood Chips - Beef Blend If you want to really impress your guests you can enhance the flavor of your food with a range of Firespice woodchips. Just soak the chips in water, drop them into the smoker box and place on the grill plates in the corner of your BBQ. Each resealable packet contains 700g of flavored wood chips. 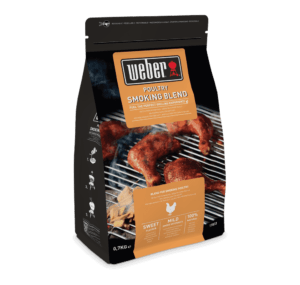 Weber Wood Chips - Pork Blend If you want to really impress your guests you can enhance the flavor of your food with a range of Firespice woodchips. Just soak the chips in water, drop them into the smoker box and place on the grill plates in the corner of your BBQ. Each resealable packet contains 700g of flavored wood chips. 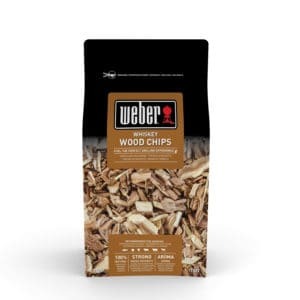 Weber Wood Chips - Seafood Blend If you want to really impress your guests you can enhance the flavor of your food with a range of Firespice woodchips. Just soak the chips in water, drop them into the smoker box and place on the grill plates in the corner of your BBQ. Each resealable packet contains 700g of flavored wood chips. 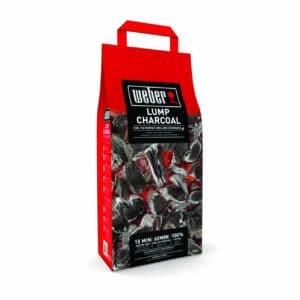 Weber Lump Charcoal 5kg 17605 Weber Lumwood charcoal is fast lighting with a burn time of around 60 minutes. 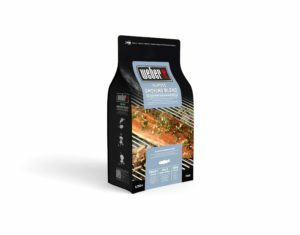 Perfect embers in just 15 minutes and ideal for grilling a wide range of meat, fish and veggies, lasting for up to an hour. 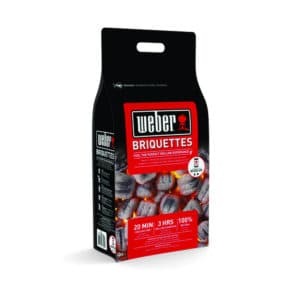 Weber Briquettes 4kg 17597 Our most efficient fuel to date. 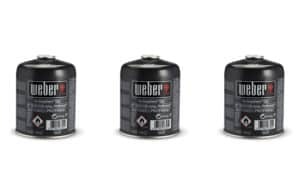 the new Weber Briquette gives you glowing coals in just 20 minutes.The large pillow shape of the briquettes means you need fewer coals to achieve great results. These long burning Weber® Briquettes offer an even cooking temperature for up to four hours, ideal for grilling, roasting or baking. 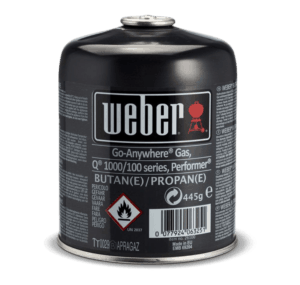 These Weber® Disposable gas canisters contain 445g of propane gas and are for use with the Q®100/1000 series, the Go-Anywhere® Gas and Performer® Deluxe Gourmet. Pack includes three canisters.